Unlock the mysteries of blues soloing in this information-packed workshop! Gain some of the tools needed to help you to improvise parts and solos, help select sounds and techniques to really set the world on fire with your licks! Many musicians get stuck in a routine and play the same patterns, chords and scales that they are familiar with or even a few choice notes that they know will sound correct. The aim of the blues soloing workshop is to open up your musical knowledge and enable you to visualise and use alternative patterns and scales to really help you become a confident and expressive soloist. There are many facets to blues soloing that go beyond simply playing the ‘right’ notes. Learning to play with ‘feel’ and expression, leaving space and even using different playing techniques to emphasise the musical message you are trying to convey. The solo is the chance for the musician to shine and show off how comfortable they are with their chosen instrument. If we want to express an emotion or feeling to another person, we have a large enough vocabulary and a skillful enough command of language to simply state how we are feeling without needing to think about verbs, nouns or adjectives. 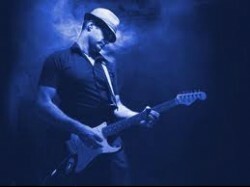 How great would it be to have the same command of music and to be able to play exactly what we hear in our heads without thinking about scales or chords?The blues soloing course will arm you with lots of skills, tips and tricks to take your soloing to the next level as well as giving you the confidence to step up to the front of the stage and really let your playing shine. After the session, your playing will develop from ‘syllabic’ to using interesting phrasing, hooks and motifs. The blues soloing workshop runs on a Monday 19th March 2018 at 8:30pm for 60 minutes and is held at Igloo Music HQ in Wickham.